Photos below are of each individual class of the Blackburn Institute. 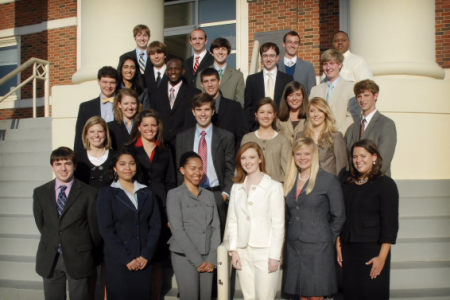 Students do not transition to Blackburn Fellows until completion of all program requirements and graduation with a degree from The University of Alabama. Those individuals that are not yet Blackburn Fellows are highlighted in the rosters below. Row 1: Josh Bell, Angel King-Rodriquez, Angelica Agee, Priscilla Williams, Hylan Noble, Ellyn Hamm. Row 2: Kimberly Kilpatrick, Elizabeth Flachsbart, Ryan Sprinkle, Meg McCrummen, Erin Shirley. Row 3: Caitlin Looney, Zack Stillings, Patty Ann Bogue, Jimmy Young. Row 4: J.W. Gallina, Milton Nettles, Steven Donaldson. Row 5: Aisha Mahmood, Matthew Brown, Tyler Valeska, Ian Sams. Row 6: Matt Wilson, John Hammontree, Kristopher Rollins, Johnathan Speer. 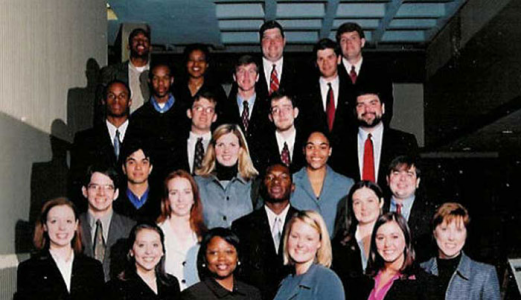 First row: Laura Dover, Daniel Odrezin, Kendra Key, Ambria Lankford, Mary Harmon Rountree, Phillips Thomas, Megan Courington, Joan-Marie Manolakis, Joan Reichwein Smith, Robert McMillan, Danielle Blevins. Second Row: Justin Zimmerman, Yongxiang “Kenny” Liang, Natalie Latta, Becky Reamey, Kristin Schneider, Martha Griffith, Meri-Glenn Freeman, Dana Lewis, James Dawkins, Marc H. Shook (Director). Back Row: Robert L. Harris, III, Andrew Vincent, Alex Chandler, Leroy Nix, Barrett Sullivan, Alex Flachsbart, Ryan Robichaux. Row 1:Virginia Thomas, Whitney Miller, Ashley Gorday, Ashley Hays, Breanna Harris. Row 2: Marion McIntosh, Mallory Morgan Combest, Karoline Richardson, Laura Bundrick, LeeAnn Wilson, Abby Grammer, Kathy Kinslow, Michelle Fuentes, Rebecca Buchanan. Row 3: J.W. Snider, Sam Todd, Tyler Flores, R.B. Walker, Steven Spiehler, Sam Masters, Jesse Homan, Kevin Garrison, Will McCracken, Robert Boylan. Jenna McCammon Bedsole, Jonathan Birdnow *, Brannon Buck, Andrew Carpenter, Lee Garrison, Eule Glenn, Bill Hankins, Jacob Hogan, Arma Marquez, April McKenzie Mason, Kim Houghton Memmesheimer, Nada Memon, Amy Mitchell, Jonathan Owens, Deidra K. Perry, Eric Pruitt, Stephanie Smith, George D. Thomas, Tracie Sempier, Wonita Williams, Jaime Wright.